Just in case you didn’t notice all the arrows pointing to the temperature it was negative 60. Yikes! Some of you probably heard this was some kind of record or something. I saw some news stories that said this was a record. Well, sadly enough it actually wasn’t a record for us. Tower Minnesota, which is less than an hour from our resort, holds the record for the coldest temperature ever recorded in the state of Minnesota -63. And I believe that recorded temperature was without wind chill factored in. 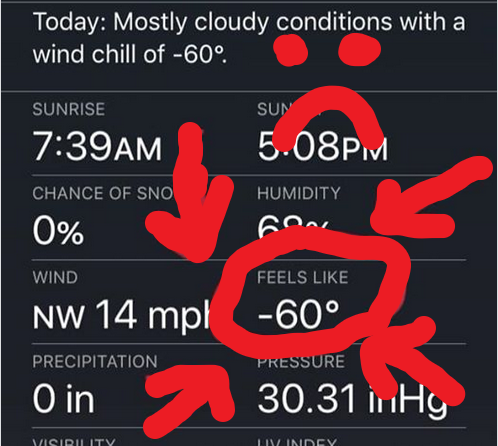 This negative 60 includes wind chill. Cold. Very cold. 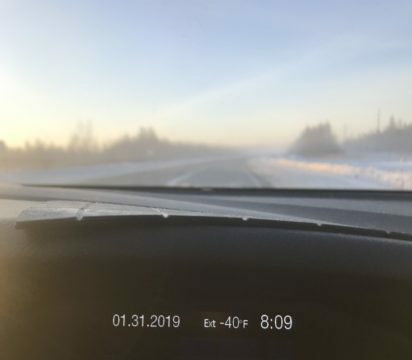 Look at that, up to negative 40! So what do you do when the temps get this cold? Well we did have a couple of pipes freeze. One of them was to the lodge and so we had no water in our house for a couple of days. But we were able to thaw it. We had about 2 feet of pipe frozen that went through the ground under the well house. It took me about 36 hours of work to get it thawed. And then I had to thaw myself! Now we have the kitchen sink trickling water so that it doesn’t freeze again. Today we are up to 9 above zero. So things are looking much better. Schools were opened again today and we are planning on going out tonight to catch the local high school basketball game. They say tomorrow we will get up to 20 above zero. Might have to get out the summer clothes! By Adam Van Tassell|2019-02-01T20:32:07+00:00February 1st, 2019|Uncategorized|Comments Off on Cold Cold Cold!